This DVD is probably unique! 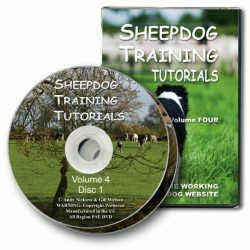 It shows you how to start working your border collie on a variety of livestock – cattle, sheep and ducks. There’s much good sense and insight packed into 90 entertaining minutes, and the training methods are kind and easily understood. An introduction to training the all-round livestock dog or specialist. “Starting your Border Collie” doesn’t just cover working the dog, it also includes assessing your dog for livestock, as well as explaining the best housing for your dog, general care and obedience. There’s a slightly different approach needed to work with cattle, sheep or poultry, but we’re still working with the dog’s natural instinct. 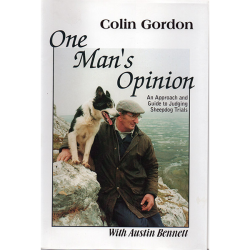 This DVD demonstrates how to harness and nurture that precious instinct to develop a practical, adaptable, working relationship with your dog. 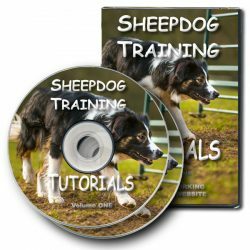 “Starting your Border Collie on Cattle, Sheep or Ducks” covers a range of training options, illustrated by five young dogs. Glen is started during the summer, on three steers. Jill is started in the fall on five ducks, for just one week, and then moves onto working dry cows during the winter months. Spot starts on sheep and stays on sheep, while Moss starts on sheep and then is put onto cows. Finally, Tess is started on dry cows in the winter and then onto three steers in the summer. You will follow each of these dogs through their progress. However, before any of these pups start training, you are led through a simple approach to keeping your pup out of trouble, and rearing it correctly to its working age. The importance of this early training should never be under-estimated. Animated graphics used throughout this video will help the viewer to understand the process. 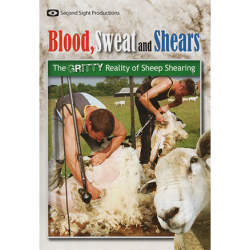 An invaluable DVD for anyone who needs a useful, all-round farm dog.